I planted cucumbers for the first time this year in hopes of making pickles. 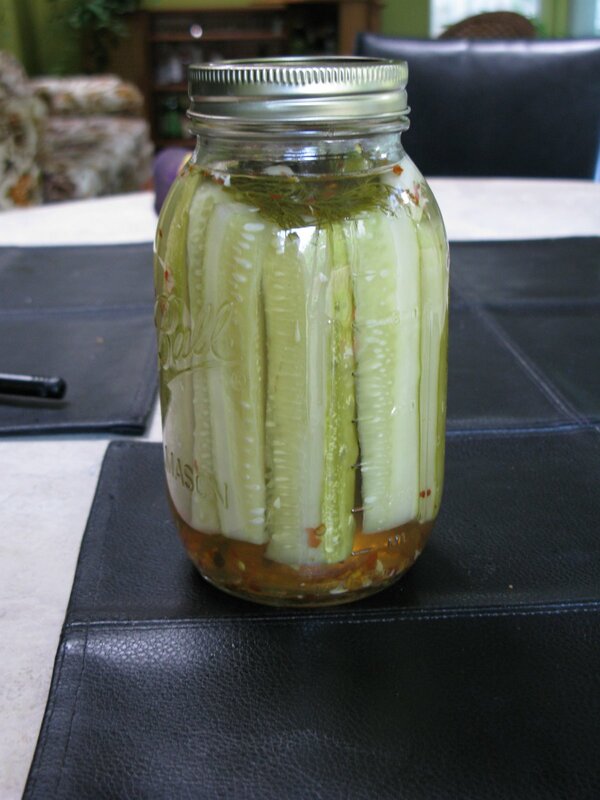 The type I grew is actually called “homemade pickles”. When I first looked online at recipes I was overwhelmed. Since I’ve never pickled before the task seemed daunting. I found a video on youtube and after watching it didn’t seem so difficult. My first two attempts were flops. The first came out way too salty. The second came out with way too much vinegar. I had also run out of white so I decide to try cider vinegar, which I had seen used in several recipes. Yuck! We quickly learned that we are not fans of cider vinegar pickles. Both batches were also mushy. Finally, last night after two weeks of waiting we tried the third batch. Winner! This one was the perfect mix of salt, vinegar and very crisp. It seems the trick is learning what ratios you like. We decided that we like a 3:1 water to vinegar. Soak 4 cucumbers for 2 hours in ice bath. This is where the crispness comes from. Make brine w/ 3 cups water, 1 cup white vinegar, 1/6 cup pickling salt. I also added a bunch of peppercorns and red pepper flakes. The red pepper flakes do add a bit of a spice to the pickles, but don’t change the flavor like adding whole peppers does. Bring the brine to a boil at the same time that you are boiling the jars. Wash the jars and lids with soap and hot water. Boil the jars for 10 minutes. That’s all there is to it. I waited two weeks to open the jar and last night an entire quart of pickles disappeared!